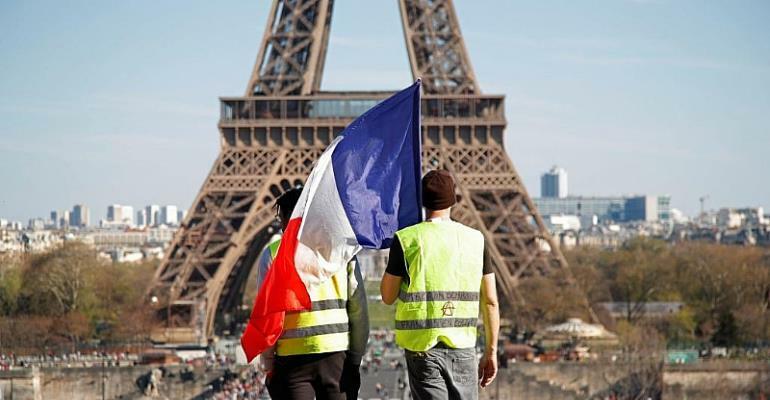 The 21st weekend of anti-government protests called by the Gilets Jaunes, the Yellow Vests, a group of discontented French citizens, are scheduled to take place in several towns and cities in France. Last weekend, 33,700 people according to official figures took part in the marches, 4,000 of them in Paris. The protestors say the number was three times higher. The protest movement is into its fifth month. Two authorised rallies are planned in Paris. Demonstrators will march across the city from different points. One will leave from the Place de la République north west to the La Défense business district, the other is due to begin in the south of the city, at the Montparnasse Station and will head north to the La Villette area in the north east of Paris. The police have maintained the ban imposed last week on marches in the Champs-Elysées or around the Arc de Triomphe. Central metro stations are closed. Many bus routes are not operating. Other towns and cities where protests have been announced are Rouen, Lyon, Dijon, Nice, Nantes, Montpellier, Bordeaux and Toulouse. The Gilets Jaunes protest was sparked in autumn 2018 over a fuel hike the government hoped would raised funds for climate change-capping projects. Under the pressure from the movement, and in a bid to halt violent incidents on the sidelines of the demonstrations, prime minister Edouard Philippe's government gave up the fuel hike. Since the start of the year the President has visited hundred of places in France, some of them outlying villages, to meet local officials and French citizens.